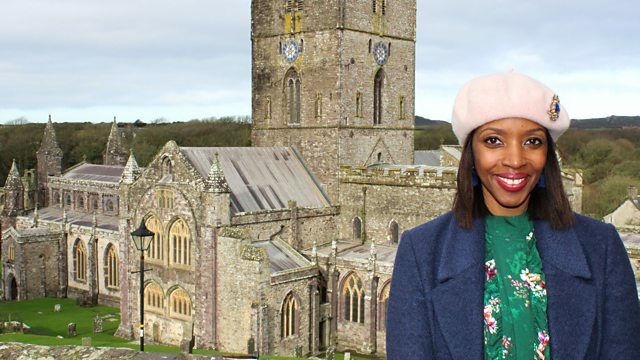 Josie d'Arby and Claire McCollum are in St David's in Pembrokeshire to explore the city's saintly connections and there's a special performance from Katherine Jenkins. Browse content similar to St David's. Check below for episodes and series from the same categories and more! and to find out more about its saintly connections. and the special well that sprang up the night he was born. and I think people still come to it on pilgrimage and for prayer. making a pilgrimage to the cathedral. St David was a man who was spreading the word of Jesus around in Wales. from our very own Katherine Jenkins. and right at its heart is its majestic cathedral. but to all this nation's saints. and Joanna Penberthy made history by becoming the first female bishop in Wales. I met Bishop Joanna on the coastal path just outside the city. what's the significance of this site? the birthplace of St David, where St Non gave birth to St David. and a legend from her time involves this nearby well. where I bless people with the water from the well. Why do we celebrate St David's Day, what were his achievements? he took the Gospel out across Britain. where churches are still dedicated to him. As a Welsh Christian, is St David's story something that inspires you? for people to pray in front of, it reminds me he was a human being. can be transforming in our own communities. life for the better, in your role as the first female bishop in Wales? and be channels for the transforming love of God, yes. So, on a day like today, what for you would be the perfect hymn to sing next? God knows us intimately. "God, you have searched me, and you know me." I think that just sums up what it is to be a Christian. in your innermost hearts and loves you for who you are. climate for farming and a longer growing season. that's cultivating faith as much as food. But the workers here are a little bit younger than usual. and those staying this week are from London. Michael Morpurgo and his wife Clare. to see those children come out of the city and experience all the countryside had to offer. they are immersed in all the muck and the magic of farming life. been planting or growing or looking after during the week. by a special pilgrimage to St Davids Cathedral. For some of them, it's their first introduction to Christianity. and to discover that perhaps there is more to life. it was actually really big and when you go inside, it's actually bigger. It seems bigger than the outside. you can't help but be inspired. I wonder if you can work out which one is St David. to tell people about Jesus, too. and say the words of Jesus. So, I wonder if one of you might dress up as the priest. really has changed the course of their life for the better. and they did really good, I liked when they sang it, the song. and see how different it looks like to London. For these children, they discover that what they do actually matters in life. that the decisions they make, the actions they take really matter. it is also hoping to become a dementia-friendly city. this goal, and have very personal reasons for getting involved. working probably an 80-hour week, which was too much really. But coping with it and loving it. You started to get dip in mood, didn't you, and things like that? what they call young-onset dementia. Did you know much about Alzheimer's up until that point? And, Andrew, how do you feel? He's OK. He's got a very good sense of humour. He's been dancing around before we started filming. And different things - you still like your sport on television, don't you? to communicate, which has had a profound impact on the family. I went through a period of sadness. and to struggle with things that were very easy. I know that for Andrew that probably isn't going to happen. because you do need a lot of patience. because if he stays well and happy, then that is good. in their church hall just outside St Davids. people with dementia and different memory problems. table tennis down in the church hall. ten minutes of something, have a rest and then go and do something else. so we became a dementia-friendly group. and it is there for anybody to use that wants to. How has your faith helped you through what you have been through? I don't think I would have managed without one. I don't know how people do. -I mean, we've used it a lot, haven't we? What surprised you the most about being in this position? I think the different path it has made us take. the Alzheimer's Society and things like that. -We have met a lot of nice people, haven't we? You know, so I suppose it has expanded our horizons really. sung by stirring Welsh male voice choirs. St David isn't the only saint associated with these parts. discover Pembrokeshire's links with another of the UK's patron saints. but also connected to Saint Patrick? tells us that St Patrick was here some 30 years before David was born. in the restored shrine in the cathedral itself. It's a very saintly place, isn't it? I think saints are very important in Christianity. quite rightly, as the Irish do St Patrick. coming here and taking an interest in this place, as they still do. And so we are very proud of the connection with St Patrick. don't end at the cathedral. which was dedicated to him. until its remains were exposed during winter storms in 2013.
on the site to unearth the chapel's hidden secrets. Roger Smith was part of the dig team. Roger, hard to believe we are standing on the actual site where the chapel is buried. 1,000 interments still underneath us as we speak. coastal elements and only uncovered during digs. Why was a chapel built on this particular site? which is a trackway which has been in existence since the Bronze Age. to what we would call harbours now for travelling. at an airport these days. People may well have made offerings here before they set sail. here is Katherine Jenkins with one of the nation's favourite hymns. # And then proclaim, "My God, how great Thou art"
for whom Mothering Sunday can be a difficult time. We return to the city's stunning cathedral for our final hymn. So in the words of St David, be joyful and keep the faith. Josie d'Arby and Claire McCollum are in St David's in Pembrokeshire to explore the area's saintly connections. Josie meets a couple who've found a new way to live with dementia and Claire visits a farm where city children get to experience country living. There's also a special performance from Katherine Jenkins. Music: All Saints of Wales from St Davids Cathedral O God You Search Me and You Know Me from St Davids Cathedral Guide Me O Thou Great Redeemer from St Davids Cathedral Praise the Lord His Glories Show from Morriston Tabernacle Chapel, Swansea How Great Thou Art performed by Katherine Jenkins on the Pembrokeshire coast The Day Thou Gavest from St Davids Cathedral.